Ahhh! Now it is August and once in a while the thought of fall crops up here and there. (Pun intended!) Here in Albuquerque the buzz is about the annual Balloon Fiesta in September. Retailers sell off their lawn chairs cheap and, my god! they are already displaying Halloween!! Already? What about my last few weeks of summer? My vacation? The kids’ being off from school? How can the time go by so quickly? Just like all the other seasons, Late Summer actually exists in terms of physical changes in the environment. It all has to do with the energy flows of Mother Earth. We all notice in the spring that the primary energy flow of earth is upward. Lovely green shoots pop up, crocus appear, buds and then flowers start pushing out of the tree branches. Spring greens, scallions, dandelion greens, peas and other early crops become available to us for eating. By the time summer comes there is massive growth that is decidedly outward and upward. Trees are fully adorned in green leaves and there is an explosion of growth of flowers, vegetables, dandelions and all kinds of stuff. A walk through the forest reveals a wonderland of growing and thriving things. Or in my case, a walk through the Rio Grande bosque. We garden and weed and yes, we have to mow every week because the grass grows like crazy! Gardens overflow with lettuce, tomatoes, beans, rhubarb, and all kinds of other wonderful vegetables, peaches and berries. But not so obvious, right now in early August, there is a shift. * A subtle change. The earth’s energy is no longer flowing so strongly outward. It starts to change to a more downward and inward flow. This is the flow that will eventually manifest in no leaves on the trees and many less things growing up. Soon there will be no need to mow the lawn and it will be time to plant bulbs for next year. This is called Late Summer. Mother Earth is preparing for her retreat toward fall and winter. Her energy has shifted but you might have to look more closely to perceive the changes. The leaves on the trees are still abundant, but their shade of green has turned a bit darker and a bit less lively. The sun sets earlier and there is the occasional cooler evening. The harvest season approaches for squashes, root veggies and apples. Along with summertime menus which I continue to enjoy, a small craving begins sneaking up on me. For squash, for more onions, for root vegetables and fresh apples! I want to enjoy the sweetness of these foods that are a bit more hardy than summertime fare. And I like to eat more of these when Late Summer comes around because they are great harmonizers with this time of year and help me prepare for the coming fall and winter seasons. * This starts around the second week of February if you live in the Northern Hemisphere. Clean and prepare these veggies and cut them into chunks. (I always choose organically grown veggies but if you can’t get organic then peel the squash first.) Put the veggies into a pot of spring water and add a piece of kombu. (This is good for added minerals and digestibility.) Bring it all to a boil and simmer for at least a half hour. When it looks like the water is thoroughly infused with the vegetables, turn off the heat and strain the tea and chill it. You can drink this through the day and I like to give it extra zip with a bit of juice from freshly grated ginger. Save the vegetable pulp and use it as a wonderfully rich soup stock! Sweet vegetable tea is an excellent way to address sugar cravings because it will help to balance your blood sugar levels. I prefer this tea rather than a lot of sweet raw vegetable juices such as straight carrot juice because they can have too much sugar in them for me. I’m not giving quantities here because I don’t know how much tea you made or what volume of sweet vegetables you have leftover. It really doesn’t matter much! Once you’ve pureed your vegetables, you will have a sweet hearty stock for a soup. Bring it to a boil, adding more spring water as desired. Throw in some onion slices. Add some sea salt. While the onions cook, wash your millet. As a guide, if you have 1 quart of soup stock I would suggest about 1/3 cup of millet. If you add more you will have a thicker soup and less will make a lighter soup. Play with it and see what you create! Pan roast the millet using a bit of olive oil for 3-5 minutes. Add the millet to the soup. Add the beans—again, add more for a more hearty soup and less for a lighter soup. When the soup is nearly done add in some corn kernels, some greens (how about escarole?) and season it with soy sauce to taste. 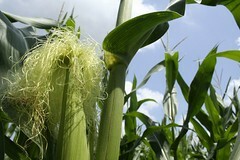 Remove the silk from corn on the cob and don’t throw it away! Simmer it in a cup or so of spring water, strain it and drink it with a dash of soy sauce and juice from freshly grated ginger. This is a great tea for the end of summertime. It is soothing to tight or overworked kidneys. This entry was posted in Cooking, Health, Recipes and tagged cornsilk tea, harmony, late summer cooking, late summer foods, millet, Mother Earth, squash, sweet vegetable tea, sweet vegetables, vegetable soup by mycookinglifebypatty. Bookmark the permalink. I love late summer, dear pen pal. I love the vegetables which burst forth from the garden, and I love mail which arrives in the mailbox from certain far-away pals who share their life with love and joy. thank you…and methinks it’s time for corn on da cob this very evening. Love that idea Kathy! Corn on da cob is so great this time of year. Happy you got the letter . . . I think we’re on a roll! OK YOUR POST rocks.. but the photo the first one makes me want to get on a plane and fly to Texas.. sigh.. no bluebells there right now but I MISS MY BLUEBELLS! OK back to finishing the blog post because as usual you rock! Wow! Thanks for the big acknowledgment! I love this photo even if it is not from late summer. 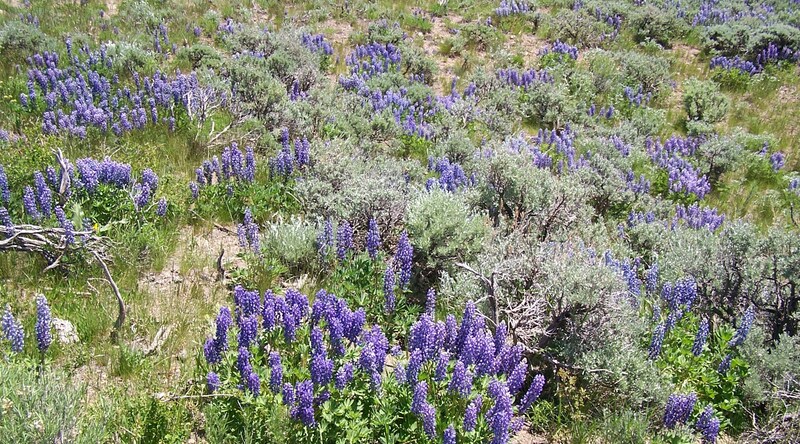 Love the purple and there’s a lot of purple and sage color around my neck of the woods right now.